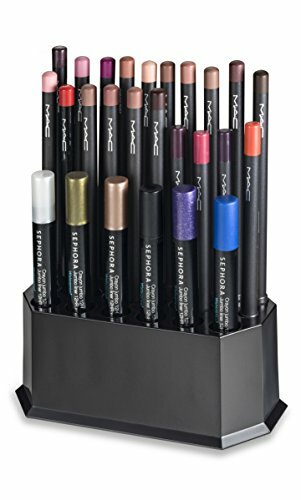 This Premium Acrylic Eye Liner & Lip Liner Organizer Comes With 26 Individual Spaces With An Efficiently Sized Footprint. SIZE: 5L x 2.16W x 2.16H Inches & Comes With (20) Regular Slots Measuring .34 Inches In Diameter And Comes With (6) Jumbo Slots In The Front Measuring .50 Inches In Diameter. SHIPPING: Enjoy World Class Shipping & Customer Service Provided By Amazon On All byAlegory Premium Organization Products. FREE Shipping For Amazon Prime Membership Members. INTERNATIONAL CUSTOMERS: For International Customers Please Check Your Local amazon Site For Availability Of Our Listings. Our Makeup And Beauty Product Organizers Make A Great Gift Idea For Friends & Family. And Don’t Forget To Hashtag Your New #byAlegory Photos & Follow Us On IG, FB & Twitter To Receive Amazon Discounts On Current And Future byAlegory Products.